The Coalition had big shoes to fill. Epic Games redefined the shooter genre and Gears of War was forever cemented as one of the best shooting series of all time. With Microsoft often touting the series next to Halo as the staples of the Xbox exclusive library, a lot of eyes were on The Coalition to deliver a solid addition to a massive fanbase. 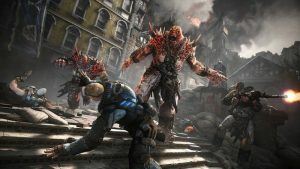 While the game is still as enjoyable as it was 10 years ago, problems with the campaign’s pacing and annoyances with multiplayer hinder the latest entry into the Gears of War franchise. 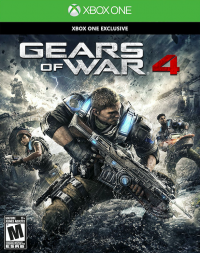 Gears of War 4 takes place roughly 25 years after the events of Gears of War 3 when the COG forces dropped the emulsion bomb beneath Sera’s core, thus destroying the Locust and all emulsion on the planet. The world looks a lot different even without the threat of war looming, as the loss of emulsion has engulfed the planet into a lack of sustainable resources and created devastating weather effects that threaten what little human life is left. Enter JD Fenix, son of series staple Marcus and his wife Arya Stroud, who, along with his team of Kait and Del, set out against COG orders to find resources while rescuing friends who have been captured by a mysterious enemy. The game does a good job of fleshing out characters and how everyone is adapting to life after war, however things seem to move too fast at times. While that’s all well and good in a shooter, for a series that depends on continuity and reusing scenes and characters in every game, it’s a shame to see many story segments feel rushed just for the sake of moving things along. The ending in particular was pretty disappointing and seemed unfinished. Gears of War 4 still is the same shooter you enjoyed on the Xbox 360, but now it looks breathtaking on the Xbox One. Despite the fragmented story, the gameplay is still as eviscerating as it was before, and some new skills add even more fun and depth to the combat. The same tactics are still around, running to cover and shooting enemies to advance through each level. However, JD has a few maneuvers his old man never used in battle, such as the ability to grab enemies behind cover and then knife them for an instant kill or the inclusion of a vault during a roadie run that can kick enemies away for an easy one-two punch. Gears of War has always been about getting up close and personal and adding these new abilities with the lancer chainsaw and shotgun means lots of blood is always being spilled. 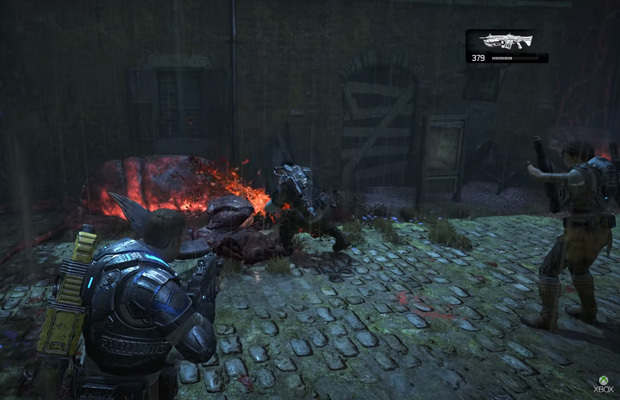 Gears of War 4 also introduces windflares, giant wind storms that are mixed with fire. During certain parts of the game you will encounter these windflares in which case you must run for cover before you are ultimately blown away. But what makes these windflares so amazing are the fact you can alter your fighting style around it, since the heavy winds can detour your bullets and shooting certain structures can cause massive piles of debris to be flown about over the battlefield. Nothing is better than seeing hordes of enemies being thrown apart like ragdolls by boulders during a windflare. As mentioned earlier, the story kind of shuffles along and doesn’t really make sense in the later parts of the game, but the game’s new characters do a good job of keeping you entertained. JD is a charismatic guy and one fitting to be the star of this new breed of Gears of War. Kait and Del show enough spark to be new favorites as well. And while old friends show up throughout the campaign every now and then to lend a helping hand, their appearance still doesn’t do enough to help you understand what is going on. Add in robot enemies fighting alongside the swarm and you have a lot of confusing moments throughout the campaign. 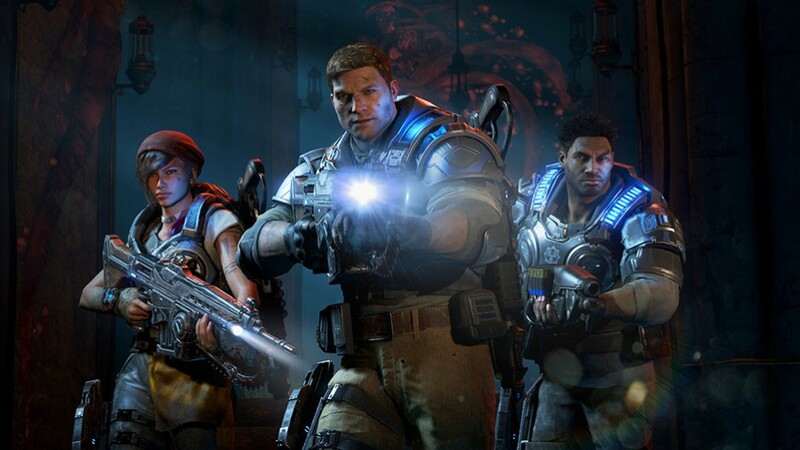 Multiplayer is where Gears of War 4 truly shines and the newly redesigned Horde mode is probably the highlight. Added to the game is a device called the Fabricator, a machine that can create anything you wish given you have enough income to do so. While it makes an appearance a few times in the campaign, horde mode is where it is utilized fully. Before each round of horde mode starts, your team is given the task of picking up the fabricator and hiding it away in a spot that is hard for the enemy to destroy it. Once done, you begin by creating barricades such as barriers, turrets and other defenses to help you fend off growing swarms of enemies. Enemies drop power now and after each round you have a very limited amount of time to run around and pick it all up. It’s this power which acts as your income for the fabricator. Besides defenses you can also buy weapons to use, restock your ammo and get buffs for your team as well. Add in the new robot enemies that are mixed in each round alongside the swarm and horde mode is a tough challenge for any team. The massive bosses you fight every ten rounds also add to the mayhem, and often a lot of cursing. Multiplayer is back too and it has your standard deathmatch, king of the hill and others, however every match still amounts to nothing more but shotgun parties. It was a problem in earlier games that Epic tried to remedy, but it seems The Coalition just gave fans more of what they wanted. It could get tiresome for casual fans who are not used to the style of gameplay multiplayer has to offer. Gears of War 4 has it’s faults, but its still a very enjoyable game. From the new combat maneuvers and wild windflares during the campaign and the fast-paced horde and multiplayer modes there is something for new fans to enjoy as well as giving returning ones things to love as well. The story felt a bit rushed and the ending leaves much to be desired, but The Coalition had big shoes to fill and they did an admirable job their first time around. Gears of War 4 still looks breathtaking and many of the new characters can end up being staples in the Xbox library for years to come, but just a little more polish and time could have made it one of the best games of the year.